Steve Jobs physical body may not be with us any longer, but his spirit and words of wisdom remain available and celebrated on places like YouTube. A true inspiration! Unfortunately, there wasn’t technology to capture what pioneers had to say earlier in our history. 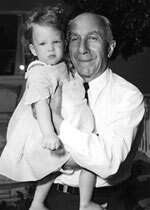 Bursting with an archive of collected speeches and thoughts of my dear grandfather, Harry Warner, one of the founders and the President of Warner Bros. Studios, I decided it’s time to share his philosophy of life with you. Now there’s the joy of applying this piece of life truth. Can you think of examples of how you’ve done this? Would love to hear about them from you, as I’m collecting your quotes to add to this book I’m putting together—juxtaposing then and now. Looking forward to hearing from you! Enjoy!